Augmented reality (AR) and virtual reality (VR) technology is more than a trend. These technologies are already disrupting the education industry. Some schools have adopted AR and VR in the classroom, enabling students and teachers to utilize the technology to learn and teach better. In this blog post, we’ll reveal why publishers should adopt these technologies in order to stay ahead of the ever-changing classroom. “Augmented reality” is a type of technology that capitalizes on the widespread adoption of smartphones. This technology uses a phone or tablet’s camera to place an image or video (such as a roaring dinosaur) over existing surroundings (like the student‘s desk). The resulting experience is a fun and innovative way to explore new concepts within the familiar context of a classroom or schoolyard. Most students are already familiar with the concept, and it is deployed by companies all over the world for entertainment. If you remember the craze Pokemon Go, you‘ve seen the addictive qualities of AR in action. One of the biggest benefits of augmented reality for students is that it helps make difficult concepts understandable and engaging. For example, instead of listening to a lecture about the respiratory system, students today can step up to a physical skeleton model with an iPad and “see” the air circulating through virtual lungs in the skeleton’s chest. This kinesthetic learning gives learners a better connection to the subject, and it might help reinforce key concepts. In contrast, “virtual reality” (VR) is a more immersive experience than AR. Instead of interacting with the physical world, specialized headsets like the Oculus Rift transport students to a totally different setting. Learners can explore the highest volcano in the universe (located on Mars) or dive into the murky depths of the world’s oceans from the safety of their classroom. The educational opportunities of VR are nearly endless, and these simulated environments can make learning fun, adventurous, and inspiring. Whether it’s a “walking tour” of the streets of Rome or the thrill of “chasing” a tornado, VR can bring classroom concepts to life. VR can also make famous parts of the world more accessible to students who may never be able to visit them in real life. AR and VR are gaining popularity across the world, and new startups are largely responsible for this. Smaller companies like Eazel noticed a gap in the market, and have since focused heavily on introducing the technology to classrooms. Now AR and VR are undoubtedly crucial parts of future educational opportunities. To keep up with the competition, publishers should recognize the possibilities of these new technologies and invest in these experiences. As the holders of much educational content, this new frontier presents an innovative way to repurpose much of what a publishing house has already produced. By optimizing your existing content with content recommendation and smart search tools, building future AR and VR programs becomes easier as your content library becomes more searchable and manageable. Get in touch with EDIA today to learn more about how 360AI can help pave your way to smart content. Interested in learning more about how technology is changing education? 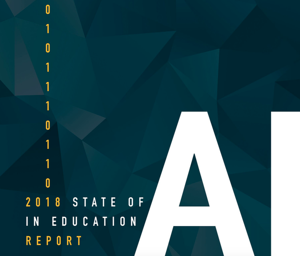 Download EDIA's 2018 State of AI in Education report today! Get the latest insights and market research about where the industry stands with AI. By the end, you'll have a better idea of where the industry is headed and how you can benefit from this technology. Don't wait to learn about AI. Click the button below to download your copy today.